It is often said that mother nature is no gardener but today I will sing her praises as I share with you some of the things she gets right. Just look how she planted this mullein , Verbascum thapsus, in my English garden. It's as though she thought the expanses of gravel needed just a little dressing up. 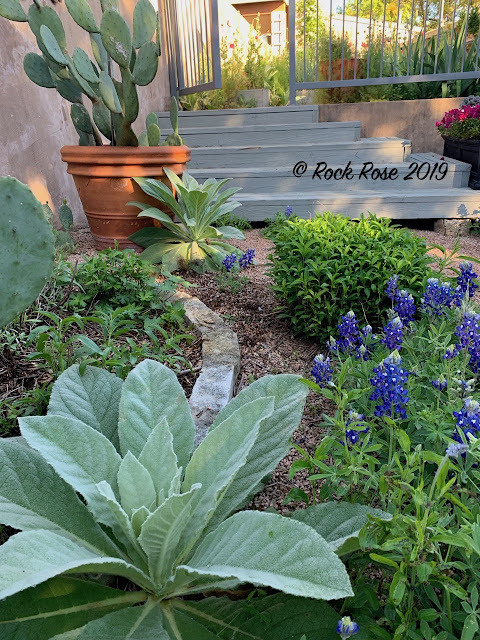 How about a few bluebonnets sprinkled here and there and a grass or two. Isn't that better? And another fine specimen at the bottom of the vegetable garden steps. What is not to love about those beautiful sage-colored velvety leaves. I will admit that she tries to have me grow more than I actually need and I am choosy. They must meet a certain criteria if they are to stay, like a nice even rosette of leaves with few blemishes. 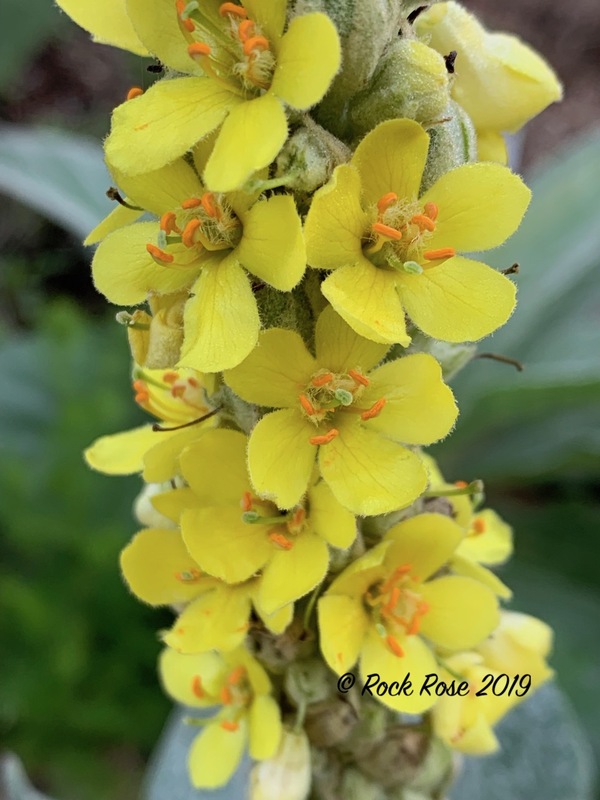 Mullein were introduced into he USA in the 1700s and are pretty widespread throughout the country. They also appear on the invasive list although I rarely see more than a few scattered around where I live. In the 80s we hiked with a Navaho guide into the ruins of Betatakin, and she told us that Native Americans used the leaves as baby diapers. In Texas it is known as cowboy toilet paper. As a biennial it reaches the rosette stage during the first year of its cycle and then sends up a tall flower stalk with pretty yellow flowers. Although, some time in Texas it achieves both stages within a year. 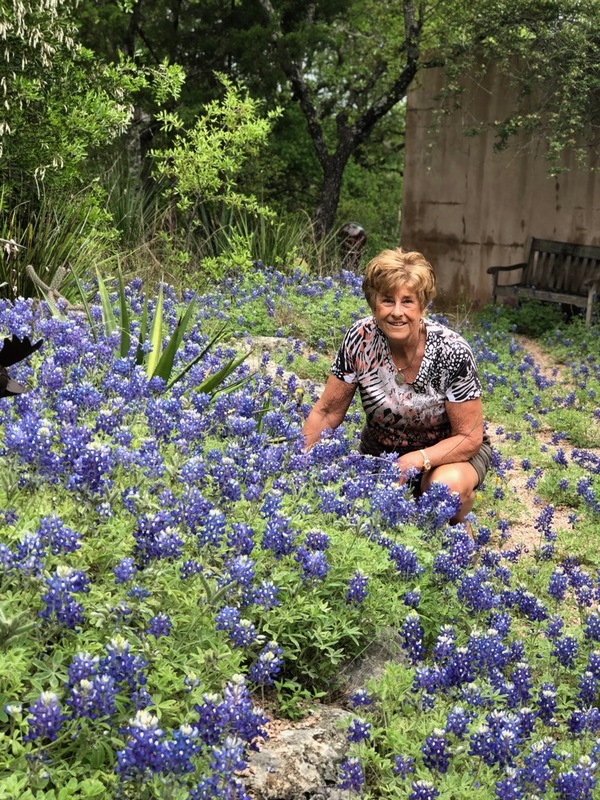 There is no better place to see her handiwork than in my sunken garden. 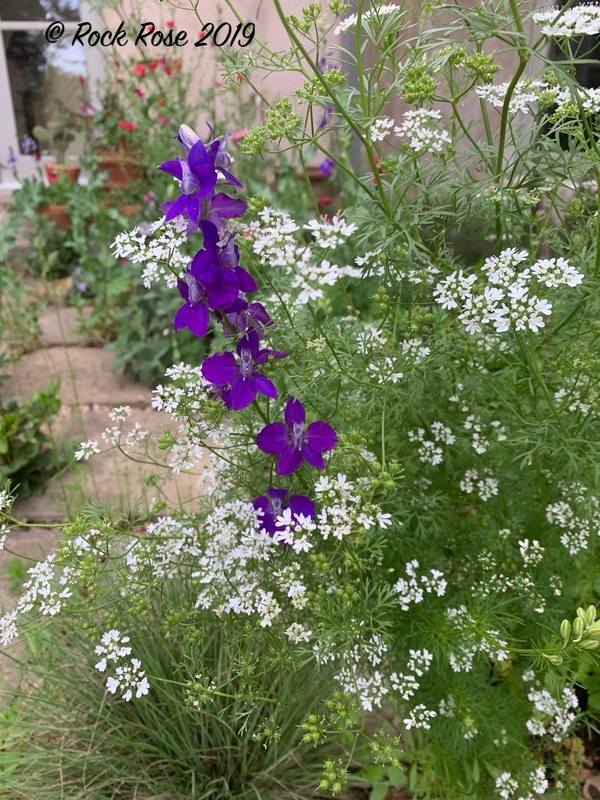 Toadflax, Nuttallanthus texanus, is everywhere this year and one special clump has me won over that this is a worthwhile plant to have in the cottage garden, particularly if you can get it to seed en masse. 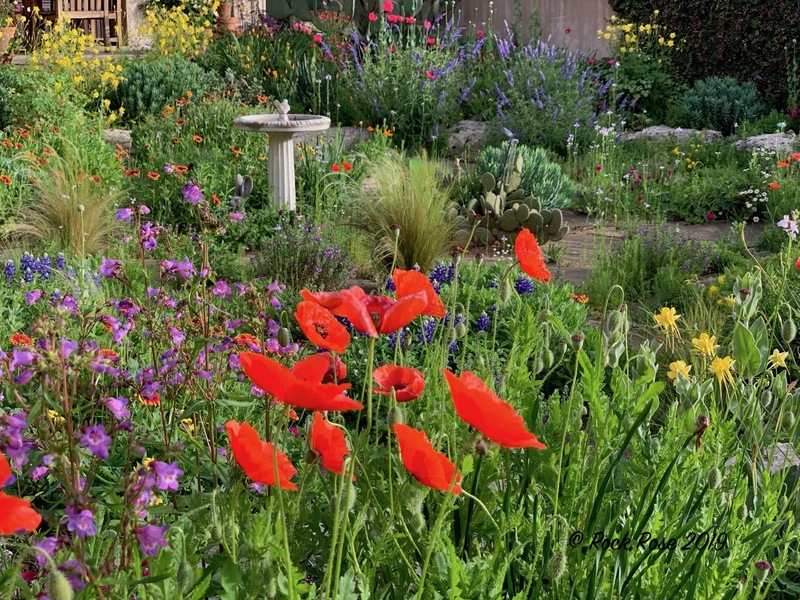 There are so many plants in this area that have self seeded, poppies, mealy blue sage, Brazos penstemon, columbine, grasses, skullcaps and even the delicious chocolate daisy. I never know from one year to the next what will be where, but rest assured, they will be there. A visitor to the garden this past weekend commented to David, out of my earshot, that there didn't seem to be very many vegetables in my vegetable garden. I could have put him straight about the change-over season, when winter crops such as kale, cabbage, broccoli and peas reach the end their lives, to be replaced by the summer vegetables. So far I had only planted some tomatoes and peppers. 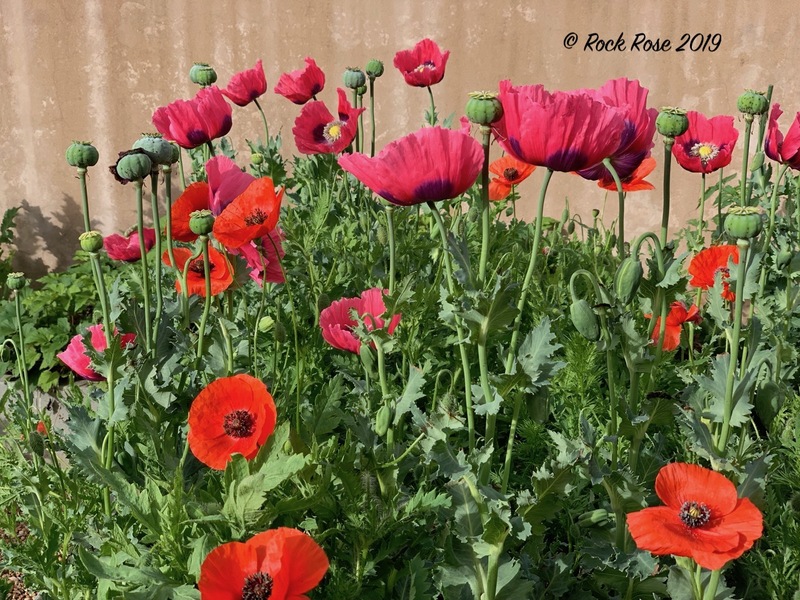 But he did have a point as many of my beds are filled with those same poppies as grow in the sunken garden. 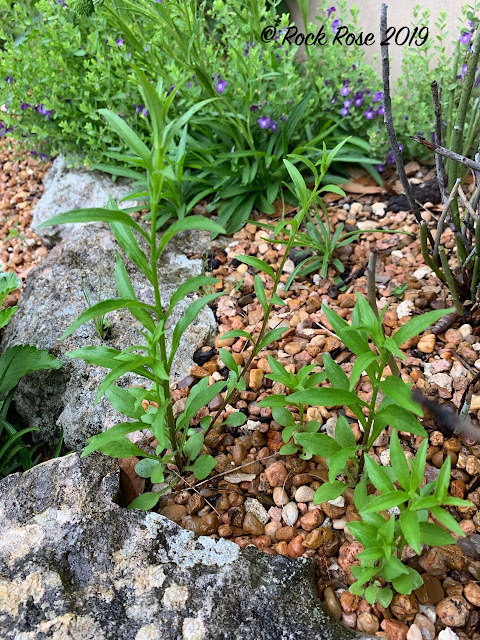 And then there are the cilantros and parsley plants which I allow to go to seed every year and repay me by filling in the beds with new plants each winter. I rather like the way she planted the pink primrose at the corner of one of the vegetable beds. Most would rip this plant out immediately because it does have a tendency to spread everywhere. I'm that different kind of gardener. and this blanket flower in the pathway between vegetable beds. 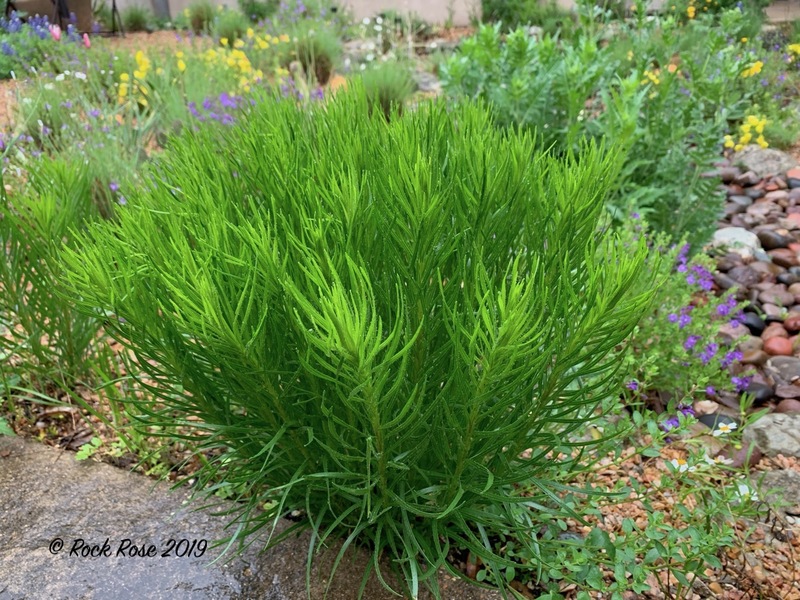 In the front courtyard I will have to take some action against the numbers of liatris that are showing up everywhere. I tried to gather the seed in the fall but much escaped and is now seeding heavily in the gravel. Most of them will be removed but this is one of the lucky ones which, in a previous year, found a permanent home. But I am truly excited to see many seedlings of this little plant, Colorado Venus' Looking Glass, Triodanis coloradoënsis. 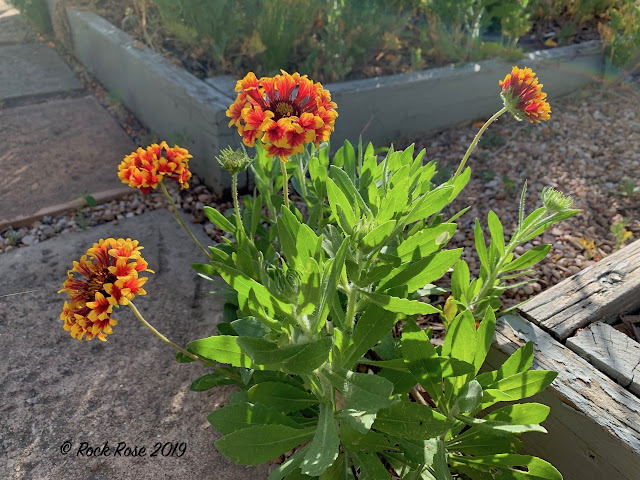 Two years ago the flower showed up in a hole in a rock I had brought in from another area of the lot, and is now starting to spread itself around the garden. 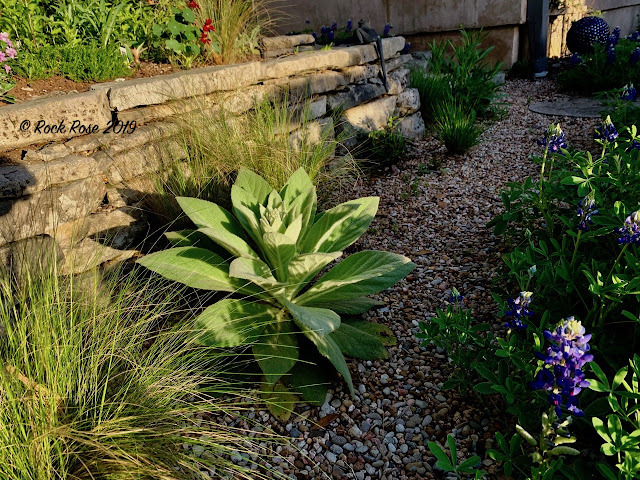 It is a member of the bluebell family and endemic to the Hill Country fo Central Texas. A delicate little beauty which I am sure to blog about when it starts blooming in a few weeks. A perfect little rock garden plant. All thanks to Mother Nature. I think Mother Nature knows a great gardener when she finds one worthy of her support, Jenny. I've got more spreaders than I used to have but I've got nothing on your collection. 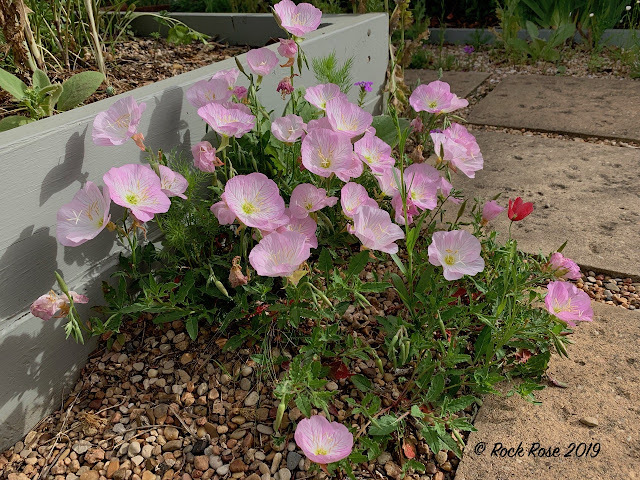 I've allowed the pink primrose to take possession on my ugly back slope because every bit of color there is to be celebrated but, based on yesterday's perusal, I think I should have followed your example and done a lot more editing. Thank god you are “a different kind of gardener”! (Note to self: the cilantros and parsley combination.) I am in love with your self seeders, and the garden floor you’ve created for them. All those self seeders have nicely filled the gaps in a beautiful casual way. Bravo! You and mother nature make a great team! I love this, and I love your garden. 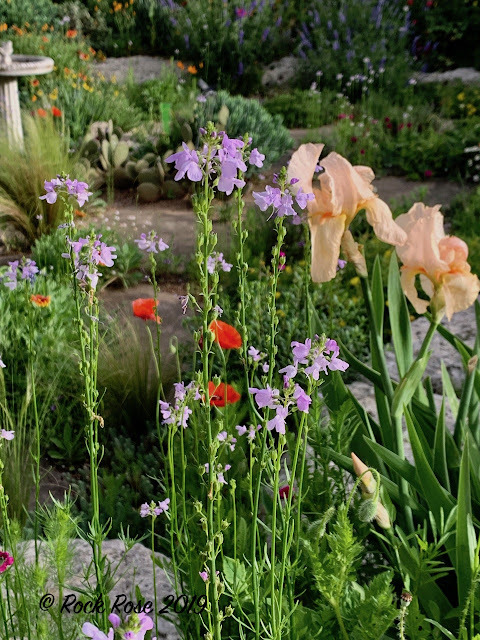 I do agree that a vegetable garden needs many flowers, too. Companion planting, right? And of course the pollinators attracted to the flowers increase the vegetable yield. Bravo to you and Mother Nature! Your garden is looking (not surprisingly) quite spectacular! I love your self sowers! I love your comments unless they are spam comments which will always be removed in comment moderation. My Gardener Says… | Yeah, it's work, but it's less work than grass and far more interesting. Emerald Ash Borer- FREE webinar!! The Dreaded Mosquito! How To Stay Safe. 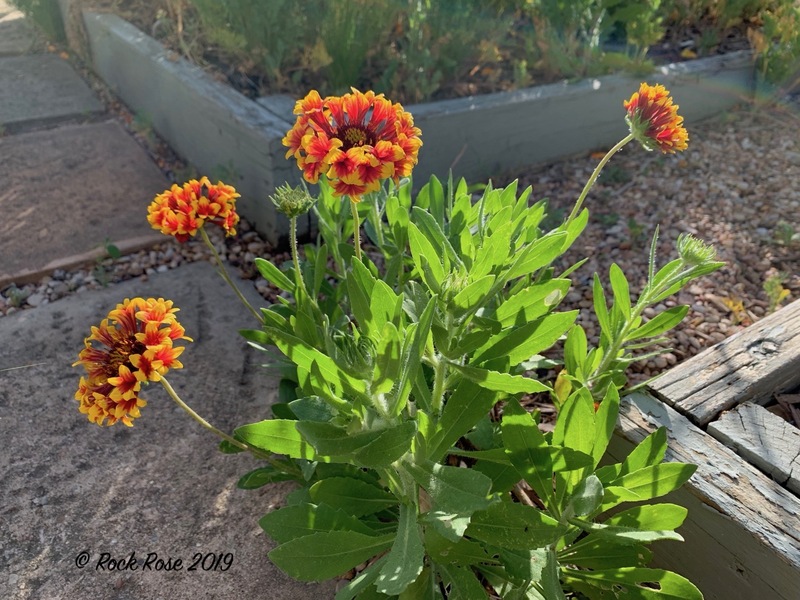 The End of Spring Is Nigh ... My Dry Tropics Garden Journal ... Week 48, 2015.